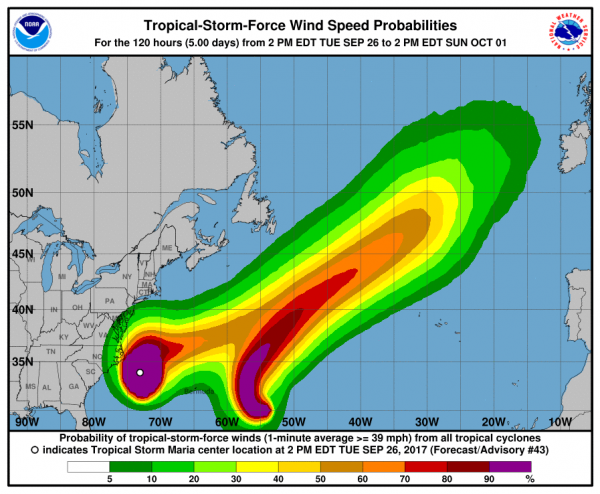 Tropical Storm Maria, which was just today downgraded from a hurricane, is brushing North Carolina and is expected to bring wind, bands of rain, and coastal flooding to the northeast part of the state. 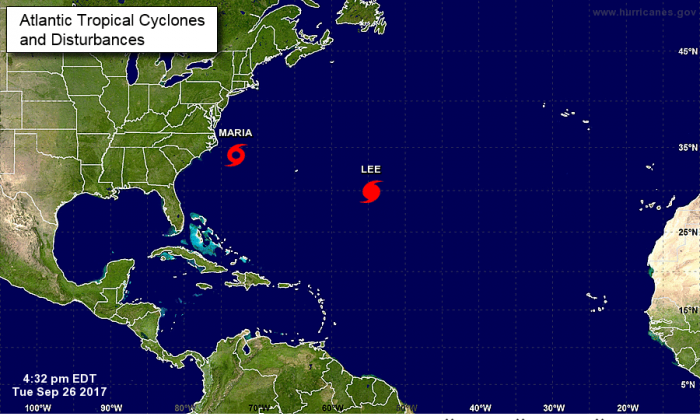 Maria is a large tropical storm with winds reaching up to 230 miles from the center. A buoy near Cape Hatteras in North Carolina recorded sustained winds of 40 mph with gusts up to 52 mph. Maximum sustained winds are near 70 mph with higher gusts, the National Hurricane Center reports. As of 5 p.m. on Sept. 26, the center of the hurricane was about 160 miles east-southeast of Hatteras and was moving north at 7 mph, the National Hurricane Center reports. 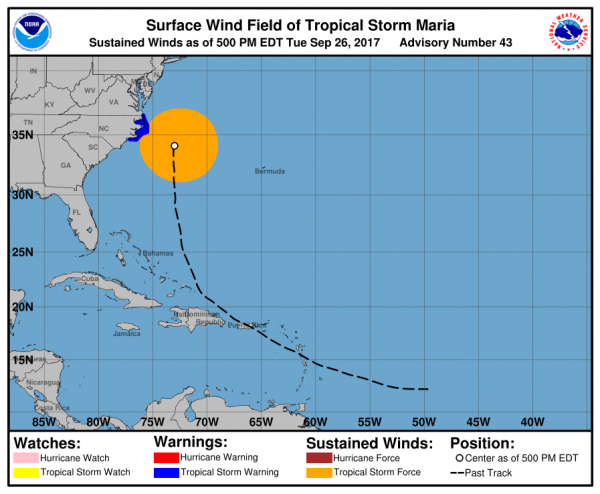 Maria is expected decrease in strength over the night and turn north on Wednesday, with a turn to the northeast predicted for Thursday. It is not expected to hit land, but tropical storm warnings and storm surge warnings are in effect for portions of the North Carolina coast. A storm surge warning means there is danger of life-threatening flooding from water moving inland from the coastline. Storm surge flooding is predicted to reach between two to four feet above ground level, including the sound side of the Outer Banks, Weather.com reports. High surf and rip currents are predicted to persist over the next few days as far north as southeast New England.